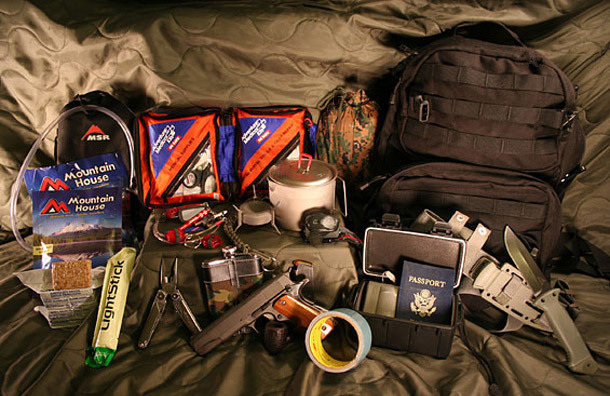 Survival kits and bug out bags are pre-prepared packs with tools and supplies to aid in a survival situation. The main difference between a survival kit and an emergency kit is that an emergency kit is more geared for surviving where you currently are during an emergency and a survival kit is for when you have to leave or “bug out” to somewhere more safe like a remote area. Survival kits are meant to be mobile and provide you the tools to acquire resources you will need later that you are unable to bring with you now. They allow you to provide for yourself by including tools to build a shelter, catch food, make fire and disinfect water. It’s basically an all in one “do everything” pack. It should also contain enough supplies to keep you alive until you are rescued or able to procure those things for yourself. Here are some things that should definitely be included in your survival kit. Knife and Multitool – Probably the most important tools in your kit. There is just so many uses for a knife and multitool, like hunting, building shelter, making tools and traps. Any kit without a knife is not a survival kit! A fixed blade knife is best for your main knife, as it will be stronger than a foldable knife and less prone to failing. Don’t rely on just the multitool as your only knife. 550 Parachute Cord and Tarps – Cordage is another very useful tool for setting up tarps and animal snares. Parachute cord can also be broken down into smaller strands that can be used as thread or fishing line. Tarps can be used for shelter, ground sheets and rain water collection. Hatchet or Saw – Depending where you are you will probably need a larger cutting tool. You will need to break down wood for shelter, heat and cooking. Survival is all about limiting calories burned when food is scarce and these tools will help you do that. Fire Making Tools – This includes lighters, water proof matches, fire steel and any other way you can create fire. There’s no such thing as too much redundancy when it comes to fire tools. You should also have some quick tinder to use in case you are in wet conditions and if you have the room you could also include a small camp stove and propane for cooking and boiling water. Sleeping Bag and Blankets – Night time can bring cool temperatures even in places that are generally warm during the day. You should have a good sleeping bag appropriate for your region as well as an extra blanket. Wool blankets offer excellent insulation in a small package and emergency mylar blankets weigh almost nothing. Signaling Tools – A whistle and signaling mirror are all great tools when you need to get someones attention. If you are in need of assistance you may only get one chance to get someone to notice you so the more tools the better. A mirror is probably your best bet to signal for help over long distances. Map and Compass – Knowing exactly where you are and what direction you are headed can make the difference between life and death. Lighting – Candles and a LED flashlight or headlamp will be very helpful during night time activities and as a backup if your fire goes out. Hunting and Fishing Tools – A small firearm for hunting game and fishing gear for fishing are fairly important if you plan on being in survival mode for any extended period of time. For smaller packs, just having some fishing line with some hooks and weights would be very helpful. Some wire to build some snare traps is also very useful and takes up almost no space. First Aid Kit – Being in survival mode probably means more injuries and chances to hurt yourself. This is not an item to skimp on! Make sure you have a complete first aid kit that will cover you for anything from small injuries to major trauma. Metal Containers – You will need containers to carry and boil water as well as eat and cook food. A couple of aluminum water bottles and a canteen kit would be ideal. Food and Water – Your survival kit should always include some water and some light high calorie food. Energy bars, cereal or anything that is high in carbohydrates. Freeze dried food is excellent because it can contain a lot of calories while being vary light to carry. What size survival bag is best if you need to carry everything on your back? Would a 40 liter bag be enough? Buy a bag that fits your kit and not the other way around. if you buy your bag first, you limit what you can put into it. Buy your gear first, then find a bag that is big enough for your gear. 40 liters can hold a lot of gear. If you plan on being on foot, a 40 liter bag full of gear can get heavy really fast. If your not a big person, say at least 180 pounds, I wouldn’t go any bigger than 40 liters if you plan to be on foot for any serious amount of time.